Trash cans, normally a mundane part of life, recently became the center of attention in Little Tokyo after six solar-powered BigBelly compactors were installed in the area. 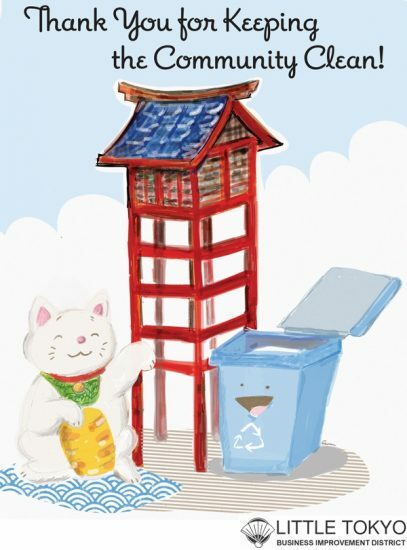 Customized by a local artist Gwen Muranaka, senior editor for The Rafu Shimpo, the “smart” trash cans bear the images of the Japanese Village Plaza yagura tower and maneki neko (lucky cat). Typography was created by Rafu graphic designer Ichiro Shimizu. 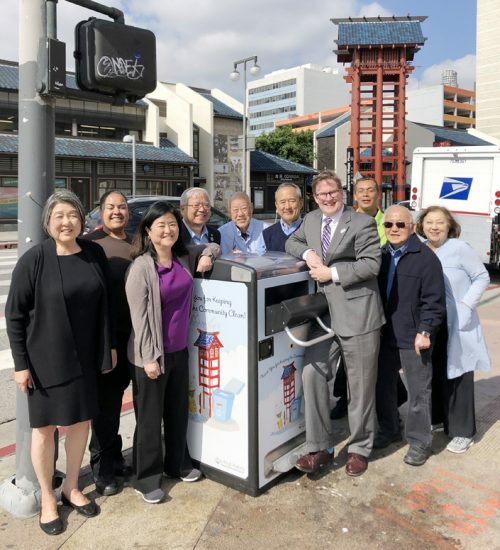 The new trash units, installed in mid-February, were officially welcomed on April 2 by community leaders who gathered to thank City of Los Angeles Public Works Commission President Kevin James for his help in bringing the new trash equipment to the area. The Little Tokyo Business Improvement District (BID) coordinated with the city to request and install the equipment. In the first month of operation, more than 3,600 pounds of trash have been collected and hauled away by the L.A. Conservation Corps, which handles street cleaning and maintenance for the Little Tokyo BID. Assembling to express their appreciation to Commissioner James were: Masao “Mike” Okamoto, Little Tokyo Business Association (LTBA) president; Alan Kumamoto, Historic Cultural Neighborhood Council (HCNC) president; Doug Aihara, Little Tokyo Community Council (LTCC) president; Ellen Endo and Joanne Kumamoto, Little Tokyo BID co-chairs; Yukio Kawaratani, LTCC Beautification and Transportation Committee chair; Lorena Ochoa, representing the L.A. Conservation Corps; and Michael James, captain of the Little Tokyo Safety Patrol.